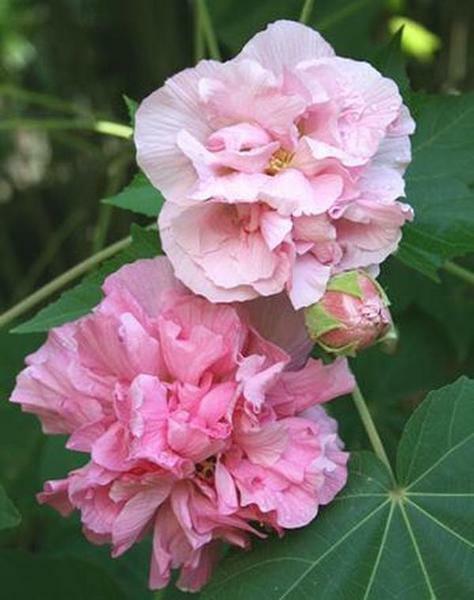 Hibiscus mutabilis is an old-fashioned perennial or shrub hibiscus better known as the Confederate rose. It tends to be shrubby or treelike in Zones 9 and 10, though it behaves more like a perennial further north. Flowers are double and are 4 to 6 inches in diameter; they open white or pink, and change to deep red by evening. The 'Rubra' variety has red flowers. Bloom season usually lasts from summer through fall. Propagation by cuttings root easiest in early spring, but cuttings can be taken at almost any time. When it does not freeze, the Confederate rose can reach heights of 12 to 15 feet with a woody trunk; however, a multi-trunk bush 6 to 8 feet tall is more typical. Once a very common plant throughout the South, Confederate rose is an interesting and attractive plant that grows in full sun or partial shade, and prefers rich, well-drained soil.